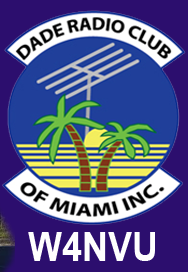 September – W4NVU – Dade Radio Club of Miami Inc.
Meeting was called to order at 19:37 with 23 present. We have a quorum. Julio was not present tonight and Lloyd presided over the meeting and welcomed everyone. The meeting was not broadcast live on the air tonight from the EOC. There was testing being conducted in another room tonight. Everyone took turns and stated their name and call sign. Lloyd welcomed everyone again. The minutes were posted on the website. A motion to accept the minutes as posted was made by Brandon, seconded by Miguel. Corresponding Secretary: Lloyd announced that there was no new mail. Website – It’s up and running. Check in on our nets and get the frequencies from the website. Club Elmer/PIO – Miguel stated that there have been no calls. And has nothing for PIO. Paddle Challenge – David needs help. Contact him at KE4TIN@gmail.com. Susan G. Colman Bik Ride – Brandon and Jason spoke. They are looking for communicators. It’s November 14. It’s only 1 day. It starts from the speedway and has 10 rest stops. They need volunteers. This is the first year that they are doing it. NASCAR racing takes place the next weekend. Hambulance Progress – Miguel announced that the keys were missing. Merritt told him were to look for the keys. Jason advised that he should have time again in January or February. Anyone can volunteer. ISS Contact at Booker T Washington Senior High School – Steve is not present tonight. Miguel advised that it is set for November. Steve will visit the school site. Hamboree – Lloyd stated that we are in trouble. There will be something but is will not be something big. Next year will be the anniversary show. ARRL will get us the convention title for next year. Hopefully he will have information for the next meeting. He is still looking for a venue. If you have any suggestions, contact Lloyd. The 147.000 – Lloyd announced that we are working on the location. The 147.760 – Ray is not present tonight. Lloyd announced it works. 220 – @ Childrens Courthouse – Julio is not present tonight. Still working on it. The 444.200 – Same spot as the 000. Digipeater 144.390 – nothing new. D-Star –It’s up and running at Jackson hospital. Emergency Committee – Miguel nothing. He already spoke. The net manager Brandon needs people to check in and more net controls. It’s a great way to get your equipment tested. You can ask any question and you can get answers to your questions. Jason spoke about the Ericka scare. Races activated on Wednesday night. They were ready and active. We have documentation for the nets. That’s how we get the radio room and grants. Our Wednesday night nets are always the same group. It only takes ½ hour. Whatever you can give. One Wednesday a month or every three months. Call Lloyd. There is a format. Take the call sign and name and the number of check-ins and send it to Brandon. Testing is still going on in the other room. Armando announced training classes this Saturday. It’s the last class. Testing will be from 1PM t 3:30 PM. Armando created a website for new hams. They are intimidated. The website is called “slack” it is at “new2hamradio.slack.com. He will start a net for the new people so they can get used to talking and they can get involved. Miguel stated the following upcoming events: you can check the ARRL website for Florida events. Oct 9 – 10 is Melbourne. Palm Beach is coming up. November is the UM Free Flea. After Thanksgiving is the Hamfest in the woods in Okeechobee. Virgil spoke about that this club is the DRC not SFFMA. He also spoke about QSL cards. We should send a QSL card for someone’s first contact. Lloyd reminded everyone that Lee Abrams will check out your radios at tonight’s meeting. He has some used batteries for “to go” kits if you are interested. He is going to try to be here each month. Lee also gave a short presentation. Thank you Lee. Great job! We had a drawing for two batteries. Miguel won one and Joanne won the other. Congratulations! Brandon made a motion to adjourn, seconded by Miguel. The DRC meeting was adjourned at 20:18.